If you are a gardener like me, then you are always looking for new ways to use the bounty. 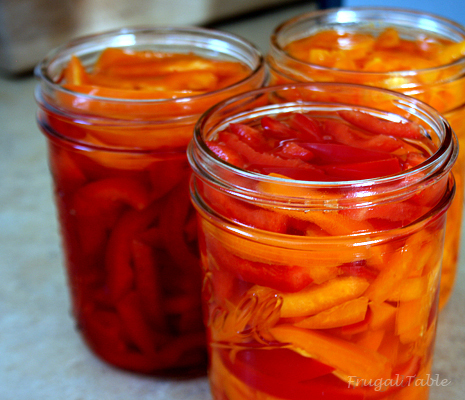 Pickled bell peppers is a great way to use up some of your garden peppers or if you do not garden stock up on peppers when the prices drop during the summer. They can be sliced and frozen and then used as needed. Peppers are one of my most used vegetables during the year. No. 1 son recently located from Chicago to Charlotte and stayed with us in between for a few months. I keep many bags of sliced red, yellow and green peppers in the freezer and noticed some canning jars of yellow peppers popped up in the refrigerator. When I asked about them my husband and younger son thought I had made them and proceeded to tell me how good they were and that they were eating them like crazy. Turns out No. 1 came across this recipe from Simply Scratch and adapted it using yellow bell peppers. No. 1 son relocated, the peppers ran out and my husband has been asking if I could make more. They’ve been on my to-make list and with chicken fajitas planned for one of our weekend dinners I made a batch of the peppers to go with them. They were an excellent addition and give a bit of a bite to the mix. In addition, they would be great chopped up in potato or macaroni salad or on pizza. As mentioned before, the guys in the house love them on subs, burgers and just about any sandwich that includes meat. Wonderfully tangy peppers. Great for Italian subs, pizza, fajitas, sandwiches, salads and much more. In a saucepan, over medium heat, combine the vinegar, water, sugar and salt. Bring to a boil to make sure the salt and sugar dissolve. Set aside to cool. 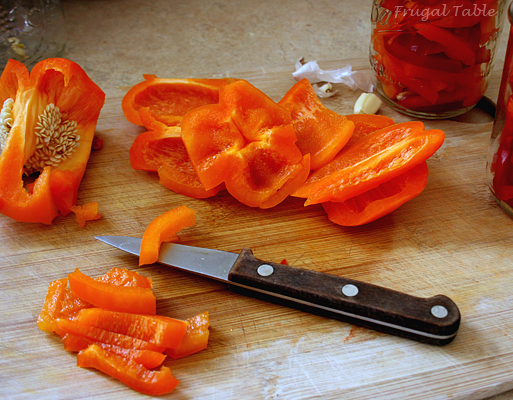 Rinse, dry and slice the peppers to your thickness preference, avoiding the seeds. Put a bit of smashed garlic in the bottom of each clean jar, then put the sliced peppers in. Really pack them in there leaving a room at the top so they can be covered completely by the vinegar mix. When the vinegar mixture is cool, pour over the jarred peppers. Top with canning lid and ring and into the frig they go! They need a day or so before you start eating them. It’s hard to say how long they will last as the first batch was gone within a couple of weeks. The recipe can be halved if you want to start with a smaller amount to try them out. Hi! I had been thinking of a recipe for pickled green bells for awhile now! I wanted to fix them like a veg melody sweet brine to can and as fridge bells! Thanks! ???? Enjoy! The recipe is also really good with sweet banana peppers. Your recipe sounds great! Thanks. I made these last summer several times. I just got some bell peppers from a friend again, and my husband asked if I was going to pickle them. I’m glad I found your easy recipe again. I found that warm tap water worked to dissolve the salt and sugar so I didn’t have to boil and wait for the whole batch to cool to room temp. Thanks for sharing! What a great idea with the warm water! I will try that this summer. I would use your best judgement. They are eaten within 2-3 weeks at our house so I never have to worry about them going bad!